"2 Level - 2 Terraces"
The highly sought after condos in Chac Hal Al - feature two swimming pools, large common areas, gated parking, 24 hour security, and is located inside Puerto Aventuras in the Riviera Maya. 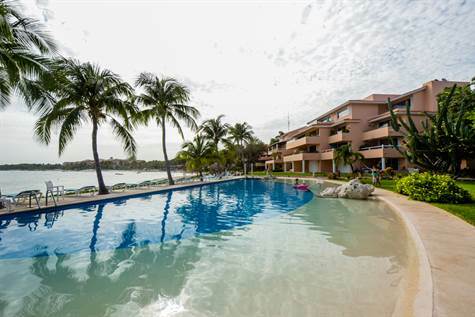 Puerto Aventuras is renown for being a beautiful beach tranquil destination. People who love and enjoy­ Puerto Aventuras Mexico return with friends and fam­ily, meet other like-minded home owners from all over to share in enjoying the Mayan Riviera. The Puerto Aventuras marina shopping promenade offers fine dinning, bars, ice cream parlours, pharmacy, curious shops. Some of the activities beside sunning at the beach, golf, tennis, diving, bicycling, snorkeling, discovering the near by eco parks, cenotes and Mayan ruins. Playa del Carmen and Tulum within a 20 to 30 minute drive. Casa Romero is for sale as is, except for owners personal belongings. The condo is a by-level penthouse with two terraces both terraces face the marina area and offers views of the garden. Only steps away two swimming pools with lounge chairs for owners and guest. The kitchen is furnished with a full size refrigerator, electric cook top and oven. Downstairs bath with shower houses a clothes combo washer -dryer, living room has a large storage closet, A/C, cable TV, WIFI services are available for the new owners. Building has no elevator, once you are in the apartment from living room to bedroom there are 14 steps. • 1 bedroom with two double beds. Current home owners fees - $13,100 pesos every three months.